Do you want to make the personality ringtone for your iPhone? Aiseesoft iPhone Ringtone Maker supports you to make ringtones for iPhone. You can input wide range files like MOV, VOB, AVI, FLV, MPEG, 3GP, MP3, AAC, etc, and now also it supports you to load DVD files as the sources. With this professional iPhone Ringtone Maker, you can enjoy your M4R ringtones on iPhone and iPhone 4. Aiseesoft iPhone Ringtone Maker can not only make iPhone ringtone, but also export the created ringtone to iPhone directly. Using this iPhone Ringtone Maker, you are free to edit the added iPhone ringtone by removing it or renaming it directly. 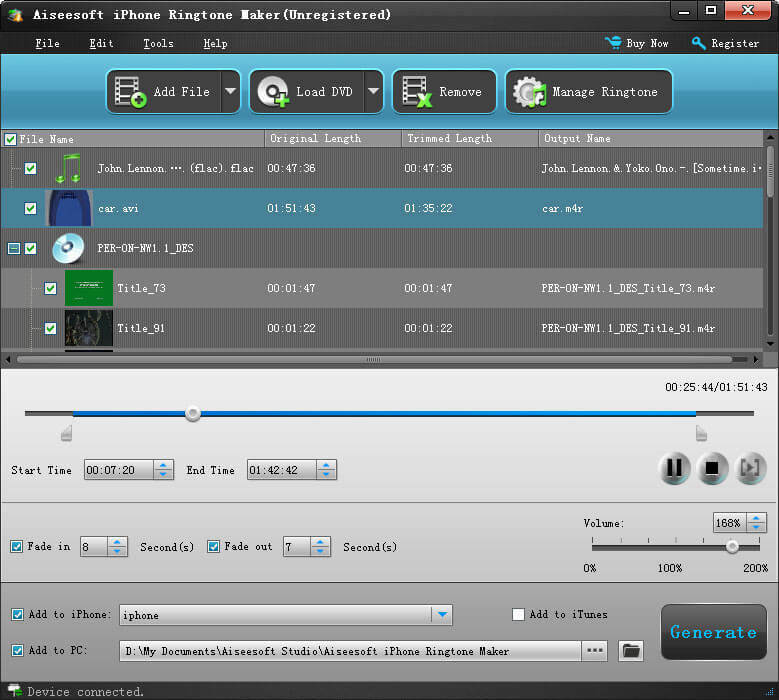 Aiseesoft iPhone Ringtone Maker is just tool for you to create ringtone from video, audio and DVD files to M4R. You can also trim a part from the loaded files and make ringtone from them by setting the start time and the end time or dragging the start/end slider to set your wanted segments. Aiseesoft iPhone Ringtone Maker supports numerous input file types. It can convert DVD, video(AVI, MPEG, WMV, MP4, FLV, MKV, H.264/MPEG-4, DivX, XviD, MOV, RM, RMVB, M4V, VOB, ASF, 3GP, 3G2, H.264, QT, MPV, etc.) and any audio format to iPhone M4R ringtone. Being different from iTunes, this iPhone Ringtone Maker allows you to make any time length ringtone according to your preference. Aiseesoft iPhone Ringtone Maker can not only make iPhone ringtone. It also can export the created ringtone to iPhone directly. With Aiseesoft iPhone Ringtone Maker, you can transfer your iPhone ringtone to computer, iTunes and other iPhone devices. The iPhone Ringtone Maker enables you to trim any segment from your video, audio and DVD sources exactly, and convert it to iPhone ringtone. You can pre-listen the sound of the video/audio sources and the converted audio before generate the ringtone. This iPhone Ringtone Maker supports all iPhone versions (iPhone, iPhone 3G, iPhone 3GS, iPhone 4, iPhone 4S) and other apple devices (iPod touch 4, iPad 2), and compatible with the latest iOS 5, iTune 10.5.